#1 Savita Punia was born on 11 July 1990 in Jodhkan village, Sirsa, Haryana. 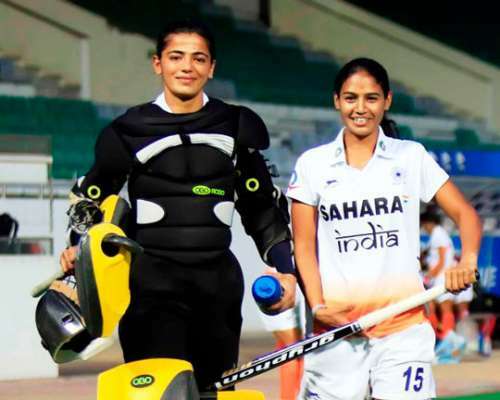 Belonging to a state that is known for being conservative when it comes to women, she had to face many barriers in order to achieve her dreams, and she defied all odds to see herself play for the Indian Eves and represent her country in the game of hockey. #2 She started representing India at the young age of 18 almost 8 years ago. Her grandfather Mahinder Singh advised her to take up the game, and she joined the SAI Centre in Hisar. Coach Sunder Singh Kharab got her to wear the goalkeeping gloves and believed she could go on to become one of the best goalkeepers the country has ever produced. #3 Her age-defying performances and stupendous skills as a goalkeeper and sharp presence of mind during her junior days caught the eyes of the selectors, and she was given a chance to play for her country soon afterwards. She had earlier starred in India’s bronze medal effort in Junior Asia Cup in 2009. #4 One of the most integral members of the Indian team, she still has to depend on her parents financially. She was promised a job under the Haryana Government’s ‘Medal Lao, Naukri Pao’ scheme, but nothing has gone in her favour. #5 She primarily plays as a goalkeeper for the team and is known to be one of the best in the business, having stopped many crucial goals in the past to help her team emerge successful in their duels against other teams. She has 121 international caps to her credit for her country. #6 Punia had made two crucial saves in the penalty shoot-out game to hand India the bronze medal in the eighth edition of the Women’s Asia Cup which was held in Malaysia in 2013. #7 She had an excellent performance in the recently concluded Hockey World League in Belgium and helped India finish 5th out of 38 teams that had participated in the tournament, which saw them qualify for the Olympics after 36 long years. #8 The whole team was felicitated and rewarded by officials at the 2nd Hockey India Annual awards in 2015. Savita was given a prize money of Rs. 1 lakh and praised for her selfless contributions to the team which helped the Indian women’s team to qualify for the Olympics. #9 Savita was also awarded the Baljit Singh Goalkeeper of the Year award at the Hockey India Annual Awards in 2015, for having phenomenal performances for India in international contributions which proved her worth as the best goalkeeper in the country. #10 She had a great show at the Hawke’s Bay Cup, 2016 in New Zealand and helped her team finish 6th in the tournament. She was fearless in the match against Australia, and her excellent goalkeeping skills ensured the Australian strikers were unsuccessful in their attempts to score goals, as the match ended in a goalless draw. She was praised by the critics for her performance in the match afterwards. The goalkeeper emerged as a saviour for the team in the fifth-place playoff against a higher-ranked Japan in the Hockey World League Semi-finals, by blocking almost half a dozen chances which included five penalty corners from the Japanese side as India won the match 1-0.